12.34 p.m. R1 11 Fly to the Moon (3 f Reliable Man – Fly Silca Fly, by Hawk Wing) – Shafiq Rusof; turned heads when storming home for second here on debut in the Maiden 1200 metres, given Heavy10, and kept finding the line from the rear when seventh in the NZB Insurance Pearl Series Maiden 1400 metres on 15 June at Te Teko. 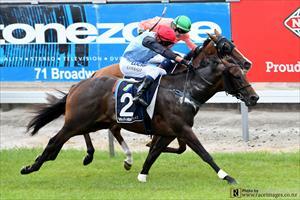 Up to a mile suits, in the $10,000 Maiden 1600 metres and she appears a solid each way chance. Fixed odds: $5.00 & $1.95. 1.09 p.m. R2 7 Avec Moi (4 m Pour Moi – Fuji Belle, by Fuji Kiseki) – Cameron Lammas; was not far away last time in the Rating 65 1600 metres on 30 June at Ruakaka, and reverts from Saturday company to contest the $10,000 Rating 65 1600 metres. Her third prior, in the NZB Insurance Pearl Series Rating 65 1600 metres at Te Teko, is good form, and she races well on her home track. Fixed odds: $6.20 & $2.30. 2.54 p.m. R5 11 Ivette (3 f Jimmy Choux – No Reins, Show A Heart) – Shafiq Rusof; trialled well recently in testing ground at Waipa, and resumes in the $10,000 Maiden 1200 metres. The way she trialled suggested a competitive fresh-up performance could be forthcoming. Fixed odds: $18.00 & $4.30. 4.04 p.m. R7 3 Ali Baba (5 g Savabeel – Dreamworks, by Maroof) – Shafiq Rusof; performed creditably for third in his first hurdle trial after finishing sixth in the Rating 65 1600 metres on 24 June at Te Aroha, and appears ideally placed for a solid display in the $11,000 Rating 70 2000 metres. He is another with good form on his home course, including two wins. Fixed odds: $3.90 & $1.55. 4.37 p.m. R8 4 Captain Risky (3 g Rip Van Winkle – Dreamworks, by Maroof) – Shafiq Rusof; finished fourth in similar conditions a fortnight ago in the Maiden 2000 metres, when stepping in distance for the first time, and contests the $10,000 Maiden 2000 metres. Stamina in the pedigree and first start on his home track gives credence to the cause. Fixed odds: $8.00 & $2.70.